Last fall I worked on an organic farm in Sicily. Initially, I hesitated to go because I would be there during Rosh Hashana, but then I found out there are Jews in Sicily! 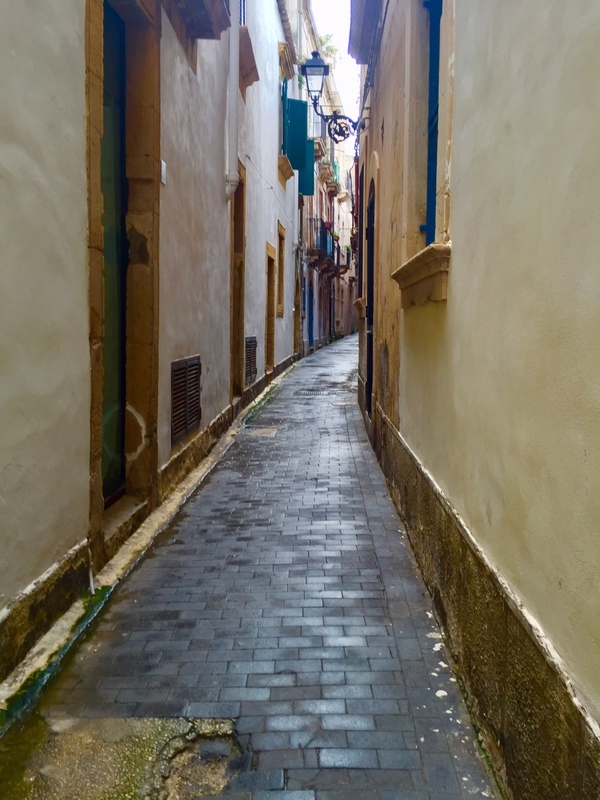 I connected with an extremely small community (a handful of people) in the gorgeous historic seaside town of Siracusa (Syracuse), where once had existed a substantial Jewish population. Just a few years ago, in the Jewish quarter, an ancient mikvah was found underneath a hotel. Far from the tourist-centered historic area is the rest of Siracusa, an unpretentious small Sicilian city, where, on an unremarkable road lined with apartment buildings and some shops, is the synagogue on the ground floor of a plain dark-red apartment building. 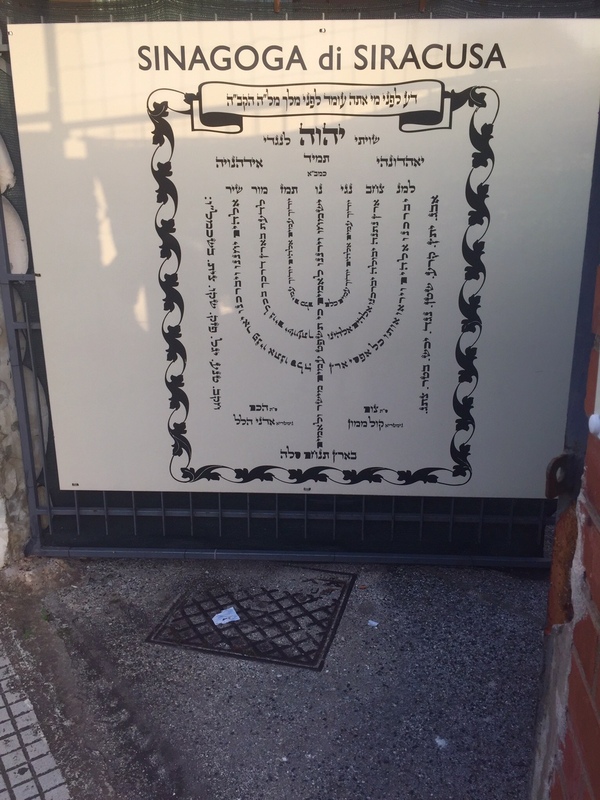 One knows they’ve arrived at the synagogue because on a large metal gate is a huge sign announcing it is here. A Sicilian rabbi who had spent the past few decades in the US and had returned a few years ago to establish the synagogue and build a community. Beyond the tent-covered modest courtyard, which seemed to have perhaps been the building’s driveway, one entered into the sanctuary. It is truly a shtibl–a small, dim room, lined with books and tapestries and a smattering of folding chairs. A steep circular staircase led to the women’s section upstairs which was a narrow, rickety wooden platform that extended around three sides of the room. There were no more than a dozen and a half people, with about five of us being American tourists and the rest being locals. The attire of attendees ranged from stilettos and full suits (Americans) to sneakers and jeans. I was the only tourist who stayed for dinner and that was the best part of the evening. All of the Sicilians I talked to that evening were anusim–they thought or knew that they had some Jewish heritage but none had been raised Jewish (not all had been baptized Catholic, though). It was a small, eclectic group of people, of all ages and backgrounds from all over this area of the island. What I found astounding and remarkable was the sincere desire of each person to learn about Judaism and make it part of their lives. They each felt in their gut that they were Jewish. And, what made it even more impressive was this sense of commitment and dedication, despite having grown up in a traditional Catholic country, without any Jewish references in their Sicilian lives. The added bonus to this Rosh Hashana celebration was that this being Sicily, the food was incredible. Without any kosher food available on the island, the rabbi’s assistant made everything, including a cheese. There were trays and trays of food for just a modest group of us. 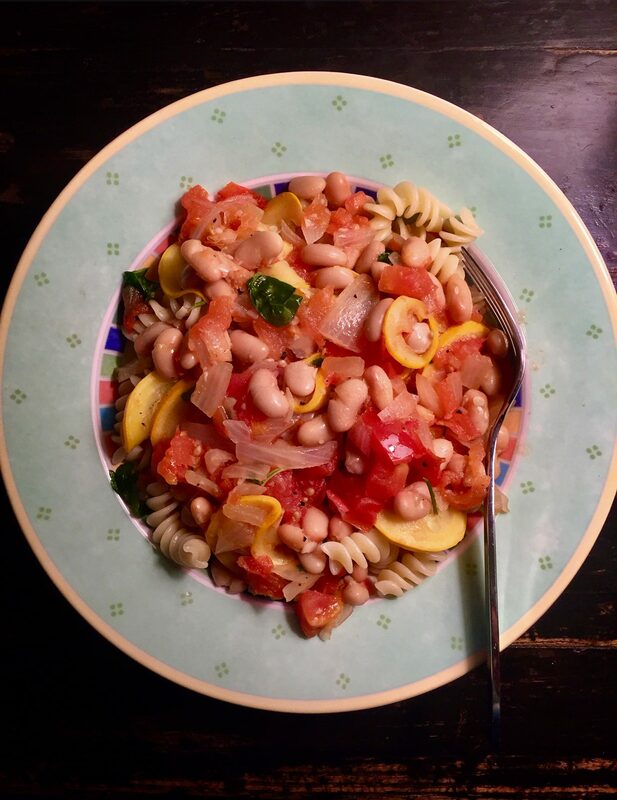 While nothing we ate was seemingly specific to Rosh Hashana, except for the ubiquitous apples and honey, one of the best dishes at the meal, I recall, was a simple pasta e fagioli dish. It was like all of the incredible meals I had in Sicily: simple, humble dishes that required no fancy ingredients and were not complicated to prepare. I didn’t get the recipe for this dish but I’ve attempted to recreate it as best I can (though I couldn’t resist adding slices of the most glorious golden zucchinis that I received this week in a farm box). Though there’s nothing traditionally Rosh Hashana in this dish, the produce is all at peak season and the golden zucchinis are cut into rounds to look like coins and whole for the new year. For all of my previous Rosh Hashana recipes, click here. PS: Since my visit in Siracusa, I learned about a burgeoning community in Palermo, the capital of Sicily. You can read more about it here. Prepare pasta al dente. Save a small amount of the pasta water. In a pan, add about 1 tbsp olive oil on low heat. Add onions and saute until soft. Add zucchini. If dry, add some of the pasta water (or a combination with more oil. Some white wine could also be good). Cook until the zucchini begins to soften. Add the tomatoes and garlic. Continue to cook and add pasta water, if needed (it shouldn’t be thin but you don’t want the ingredients sticking). Continue to cook on low heat until the tomatoes are soft and easily broken apart, for about 5 minutes. Add the beans and mix well. Cook for a few minutes. At this stage, you can mash (or puree in a blender) part of the beans and tomatoes into a bit of a sauce. If it’s too thick, add more pasta water, if needed. Some of the zucchini might get mashed too. If you mash part of it, once finished, add the blended mixture back into and mix all together. Fold in the freshly chopped herbs. Drizzle with a fruity olive oil and add salt and pepper to taste. Let sit for a minute. Serve over the pasta or fold pasta into sauce and mix well. 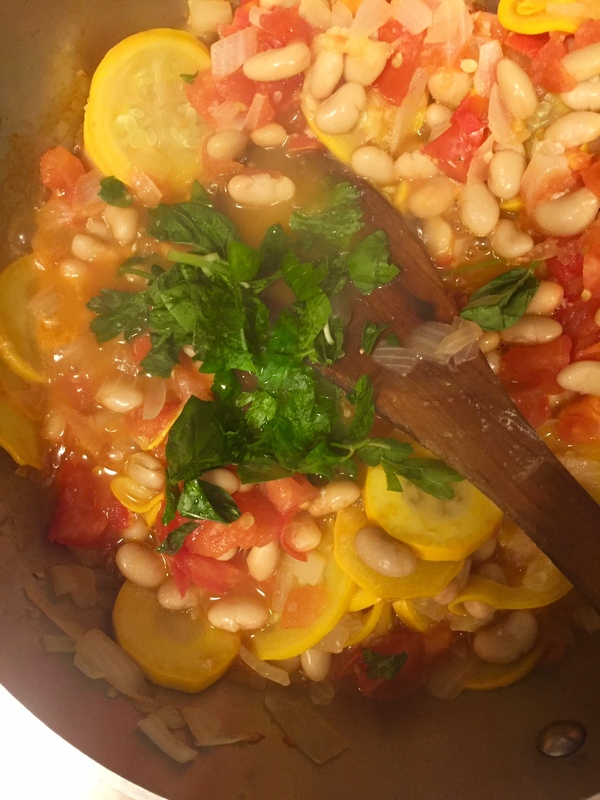 This entry was posted in Entree, Holiday, Rosh Hashana, Tishrei, Travel and tagged cooking, food, Jews, pasta e fagioli, Rosh Hashana, Sicily, vegan by Sarah Newman. Bookmark the permalink. What a wonderful journey you were on! These are places I knew little about the Jews who have lived there. The recipe looks very tasty and hope to try it this Friday. Your stories are always of interest and how you bring the story and meal together is beautifully accomplished. I can’t wait to try this recipe. glad you’re enjoying the posts and thanks so much for your comments. Lovely , I like very much the origin of this recepy and going to prepare it very soon . Beautiful story and tasty-looking recipe! Even better the recipe looks like something I could easily make. The picture of it is so colorful and beautiful. Why not have an Italian feast on Rosh Hashanah!